Using a tea kettle or saucepan, bring 3 cups of water and honey to boil. Turn off the heat, add the tea bags, and steep for 6-8 minutes. Remove tea bags and allow remaining liquid to cool for 15 minutes. In a martini shaker or bowl, muddle one cup of grapes with the mint leaves. Add muddled grape and mint mixture to a large pitcher (about 60 ounces), along with remaining 3 cups of water and orange slices. Stir in the hibiscus tea mixture and refrigerate for at least 30 minutes. Strain before serving. 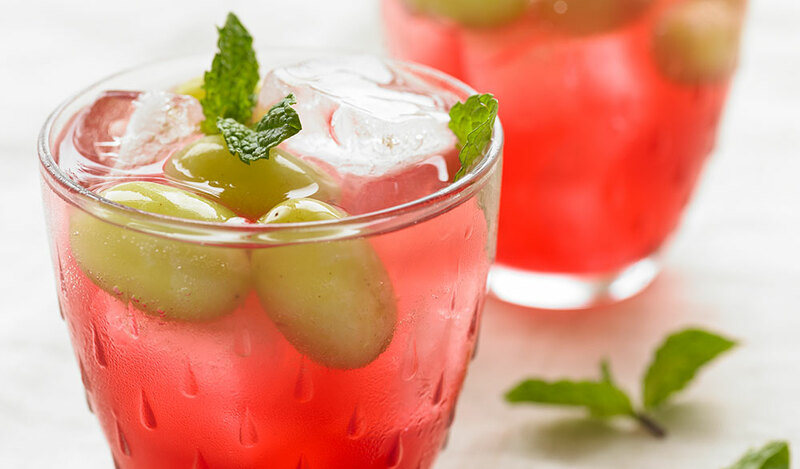 To serve, add ice and 3-4 grapes to a 10-ounce glass. Pour in 2 ounces of sparkling water and then 6 ounces of the hibiscus tea mixture. Nutritional analysis per serving: Calories 70; Protein 1g; Carbohydrate 16g; Fat 0g; Cholesterol 0mg; Sodium 10mg; Fiber 1g.